In this three part series, I am taking you through Amazon Web Services (AWS) Config. It is a lesser known service from AWS but an incredibly powerful tool. In part one of the series, I went through how visibility is gained every time a configuration item is changed, the five features in which AWS Config is built upon and how to adapt it specifically to your needs. In this second post, I am delving deeper into the key concepts of the service, the AWS Config timeline – my personal favourite part of this tool, and the rules for building up the base capability of recording all changes. 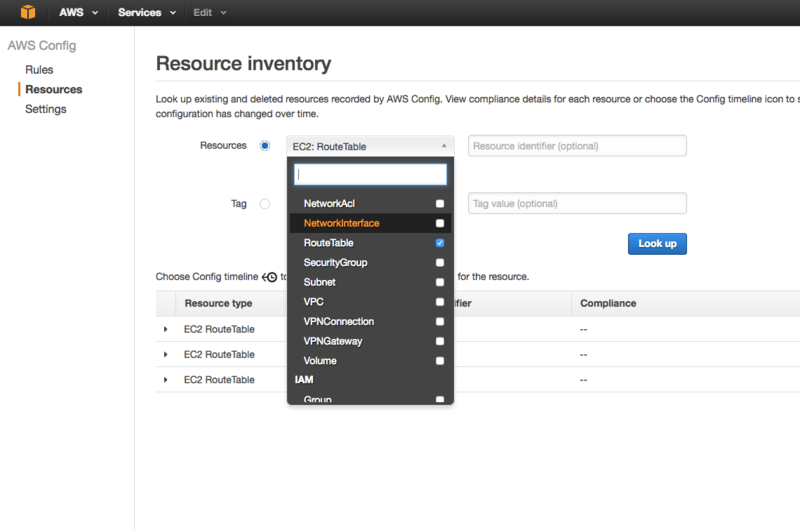 Once configured, AWS Config provides a resource inventory from which you can search for common resources. You can search for resources by tags, for example, if you wanted to show all items tagged under “production”. You start to then understand how powerful this tool can become from an audit and compliance perspective. 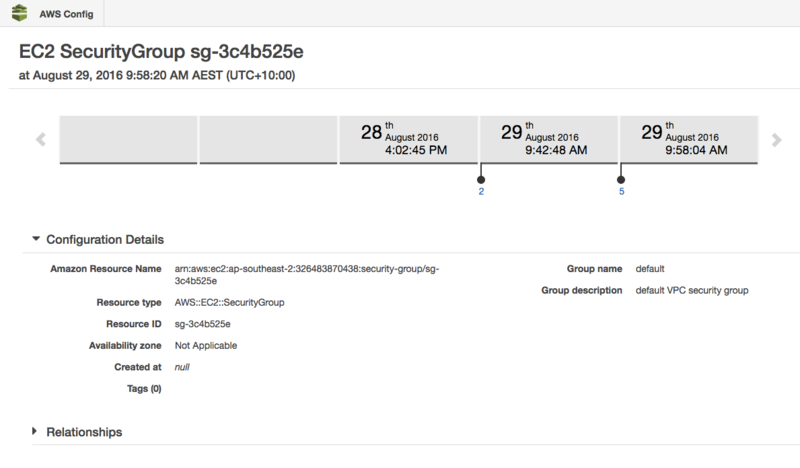 As mentioned, the AWS Config timeline is my favourite part of this tool. Each block shown on the timeline is a configuration item and the details of each change is captured. The example below shows the changes (rules) added to a Security Group. If the item chosen was a long-lived EC2 Instance, over the lifetime of the instance it would allow us to do some very interesting time travel through all the changes made. You can also view all of the Instances relationships to other AWS resources. Relationships are automatically generated for you and are bi-directional. Changes made to any resource are also automatically propagated to create Configuration Items for related resources. Note that data shown in the timeline view maybe up to 10 minutes old. There are also two methods of triggering actions based on Config Rules. A rule can be raised when relevant resources change and these changes can be scoped to a specific resource ID, tag or group. To give you an example of this, if a resource is created that is tagged with PRODUCTION, the Configuration item will immediately be evaluated and / or an action will be triggered if the item does not meet the required criteria. Secondly, you can create rules that are triggered periodically to ensure that a threshold of a number of instances is not exceeded within a 4 hour period. AWS use the concept of an Evaluation which is the result of evaluating a Config Rule against a resource. The Rules section clearly shows compliance or non-compliance with your defined rules. A subtle thing to note is that if you define a rule for a tag that contains a number of Configuration Items and link it to a Config Rule, it will only be compliant if all items are compliant. Creating your own rules allows you to codify and automate your own internal practices. This means you can build in your own customised and bespoke guidelines for security and compliance. AWS Partners are also writing rules that can be run in Lambda. In part three of this post, I will explore the growing ecosystem of partners around AWS Config, how the service can protect you from a common security concern and the reports that it can generate to solve security queries.